Join Everyone’s Favorite Purple T-Rex And His Friends For A Dino-Sized Movie Night! It’s a night of epic proportions filled with imagination, caring, learning, singing and dancing when Barney®: 3–Movie Pack roared onto DVD October 15, 2013 from Lionsgate and HIT Entertainment. This super-dee-duper collection of three feature length movies will fill the hearts of young ones as they enter the land of make believe, have fun making music and celebrate the biggest event of the year – Christmas. The Barney®: 3–Movie Pack DVD is available for an incredible low price of $19.98. Trusted by moms and adored by children, Barney displays sharing, caring, imagining, dancing and learning on television, online and through live events, home entertainment, toys and publishing. In 2013, Barney celebrates over 25 years of sharing, caring and imagination with the Barney 25 Million Hugs campaign. Barney is inviting fans of all ages to help him reach his goal of sharing 25 million Barney hugs around the world through the site www.ShareBarneyHugs.com and via email, Facebook and Twitter. It's time for a musical adventure at Barney's Fantasy Fair! When a little girl named Melanie dreams of playing her violin in a talent show, Barney, BJ and Baby Bop help her realize her dreams with the help of a new dino friend, Riff™, who knows how to find music everywhere! Riff shows the friends all about music and sounds as they sing favorite songs, play games and ride amazing rides! They also discover that some dreams are even bigger than they imagined. So head to the fair, join the fun and let’s make music together! 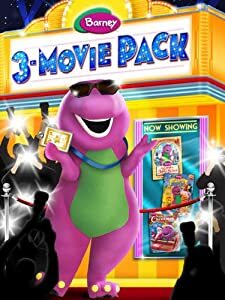 Buy It: You can purchase Barney®: 3–Movie Pack for $16.98 from Amazon.com. Win It: (1) Barney®: 3–Movie Pack DVD to a lucky winner!